These two men only got involved when the situation got so bad; action was needed. The beachfront owners started all of this when they erected the signage back in 2012-13. I believe that was one person and one development and we all know where it is. Where are the other places you are referring to. I sincerely want to know. Thanks. Open beaches are for EVERYONE in America,... unless you're way too lmpressed with yourself (like "The blustering lawyer and his 'mini-me ding-a-ling' shoulder-pet"), who, for too long, believe they 'control Walton residents' with forceful rhetoric across a 'liquor fed' bar-top with a ding-dong bell and a view of the sunset over the Gulf... Beaches are FREE (even for mental midgets who prefer controversy... (which seems to be the prevalent "Democrat sport" in all of America these days). [Take it to Court "small-time elitists",.. before you "kill the Goose that laid the golder egg" right in your "soiled" laps ! ! ! Another outrageous, anti consumer law from the Florida legislature. Growing up in Florida, it was a family tradition to go to the beach on the weekend. You put your towels, cooler, chairs, flip flops in the dry sand while you went in the water. Or maybe you spread out the towel to get some sun. The line of sea oats at the top of the dunes was the defining point where the public space ended. Going to the beach was something folks could do for free. Now with development it is harder to find access (walk throughs) and parking. They even desegregated the beaches in the 1970's. The last thing this "pro-business " government should be doing is blocking anyone, resident or money spending tourist from enjoying the sand, water and sun. You knew there was a beach with the dreaded commoners using it when you built your condos or your mansion in the first place. Public beaches for all in Florida. Anyway this can be made to happen. Simple. 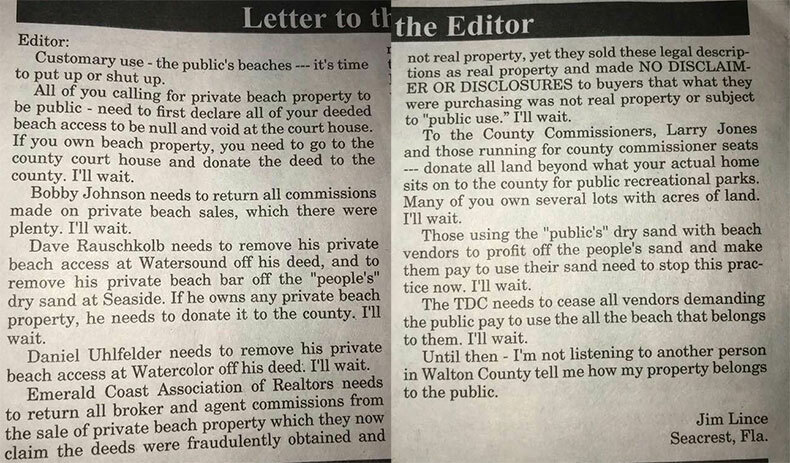 Yes, you purchase beach front property and donate it to the county for public use. Or you can donate your own property so the county can sell it and use the funds to purchase private beach property and turn it public. You could also use the courts to turn private property public through a court action without compensation against the 5th amendment of the US Constitution--- but then you would have failed 7th grade civics class. You could also stand in the corner of a store, and yell at everyone you are going to hold your breath until you get your way - that the store gives you some free candy and stomp your feet and cry how everyone is mean to you - like what grown ups in Walton county are doing, but then you would be a spoiled childish entitled brat. For decades, Florida beaches were open to all. Unlike other states where beach access is limited as Private Property or governed by local municipal statutes (go to New Jersey and try to get on the beach without paying), Florida's pristine white sand was open to all. Now, all of a sudden, beachfront property owners can claim their property line ends at the waters edge. Is that at high tide, or low. I guess the line changes daily. Next we'll be claiming a 12 mile international line out to sea. Coastline is, and should be public land. I sure would love to see the deed to their property, and the survey that shows their property line extending to the waters edge. Stop the nonsense. The DEP reports there are 1,200 miles (out of 2,000 total) of private beach property in Florida. There is no "now all of a sudden" --- maybe for you where your history began at breakfast. But for those who have researched - there have been deeds to the MHWL recorded as early as the late 1800's. You can view hundreds of deeds to the MHWL at WALTONPA.COM it's open to the public and it's official records. Florida is a recording state for real property, if it was bought or sold it's in the official records. I will be glad to show you my deed. I have not minded anyone using the beach in front of my house as long as they cleaned up their trash, and neither have my neighbors. I have lived here full time for a decade and there has not been one single issue with anyone on the beach here. But, there are also no beach chair rental companies around either.